Picture this: You’re sitting in a chic Santa Monica restaurant, chatting with friends between courses of foie gras mousse and roasted duck, when you start to feel…something. An easy smile, sticky eyes, a slight euphoria. Everything suddenly tastes really, really good. It could be the wine, the company, the food, but most likely it’s that OG Kush permeating each dish. This isn’t a THC-induced fantasy—it’s Herb, a cannabis-focused restaurant set to open along PCH in Santa Monica later this year. The man behind the munchies is Christopher Sayegh, aka the Herbal Chef, a 24-year-old who is pioneering weed-infused fine dining in California in the wake of the Adult Use Marijuana Act, or Proposition 64. “I’m creating an entire dining experience through atmosphere and ingredients,” says Sayegh, who masks the vegetal characteristics of cannabis so the flavors of each dish shine through. The psychoactive effects of different marijuana strains are taken into consideration the way a sommelier might pace out wine pairings. “I don’t want to get people so fucked up that they forget the whole night,” says Sayegh, who regulates the dosage of THC for individual diners. Serious stoner? You could get 50 milligrams stretched throughout the meal. Novice? Maybe 10. If he doses correctly, the THC starts to kick in by the second or third course. By the time serious munchies roll around, you’re into the bigger, more savory mains and then simply giddy by dessert. Regardless of tolerance, nobody will be able to just pop into Herb, order a sativa salad, and go. Prop. 64 allows for the possession and use, but not yet the purchase, of weed. 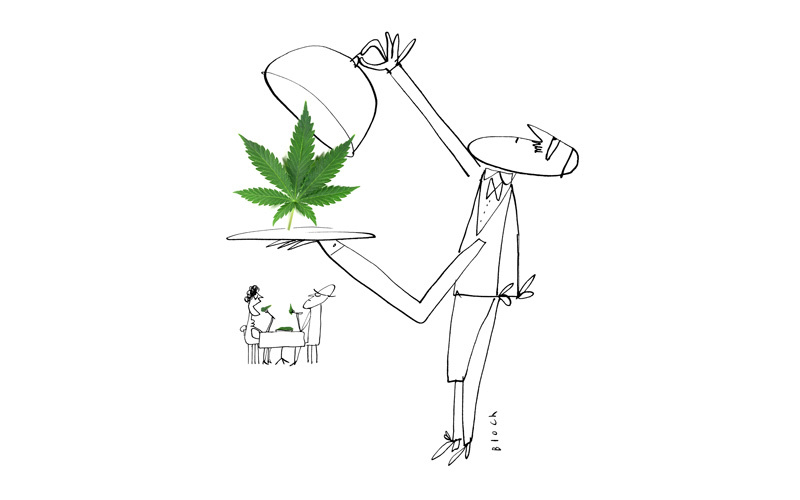 So, along with a reservation (a pre-paid one at that, for a three-, five-, or ten-course meal that ranges between $80 and $300), you’ll still need a medical marijuana card, which Sayegh happily helps diners obtain during dinner via PrestoDoctor, an online video prescription service. “We’ll streamline the process as best we can,” Sayegh says. “Eventually we will be able to have casual walk-ins.” For now, if you aren’t on foot, that $300-per-person price tag comes with an Uber ride to the restaurant and back. Just in case.